Raising awareness on the need for responsible use of water and providing a critical analysis on water access in different parts of the world, as well as the barriers to access, are the core aspects of this Museo Mundial installation. Water is the basic element of life. The balance of the Earth and our future depend on respecting and conserving this precious liquid and its cycles. However, the United Nations estimates that, by 2030, the planet may face water shortages of 40%, unless we dramatically improve our management of water consumption. 2015 represents the beginning of a new Agenda for Development. The new Sustainable Development Goals (SDGs) must hold all countries to their commitment of building a more socially fair, economically viable, environmentally sustainable and politically active world through a group of objectives, goals and indicators that reflect the desire to promote social justice. This installation aims to raise awareness on the Sustainable Development Goal that aims for “clean water and sanitation". Taking advantage of the strong connection between the Museum and the topic of “water”, a water xylophone was created using water bottles, so that through each musical note the visitor can hear that "water is life". The main feature of the installation is a table covered with vinyl, containing the sheet music for a well-known children’s song (“twinkle twinkle little star”) and also the musical notes that the xylophone is based on. On top of the table, several water bottles were “tuned” to particular musical notes. 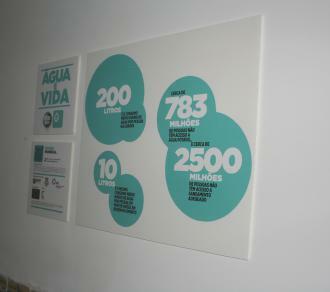 The vinyl displays information and facts about global water consumption. Visitors confronted with this tool were keen to play the xylophone and to study all the elements forming part of the installation, including the leaflet. The installation was initially placed in the museum’s garden, but it is now situated in an access corridor between the cloister and the gardens. All tiles in this area of the museum display water-related scenes. Visitors can sit on a wooden stool while playing the xylophone. In addition, a partition to hold leaflets was built. What do we want to highlight and why? When talking about development, it is impossible to ignore water access. In fact, water access conditions the social, economic and environmental situation of people and communities. Therefore, by creating this installation, we aimed to give all museum visitors the chance to reflect on these issues, focusing above all on access to water as a driver of the development process. This installation should engage citizens of all ages. Once the topic is identified, it is necessary to consider the location, ideally a place conducive to making an “obvious” connection between the topic, the objects and the installation. After the initial process of developing the concept and defining the overall objective, it is necessary to identify the products, goals, and deadlines, as well as the suppliers, in line with the available budget. It is important to keep in mind that the installation will form part of the Museum’s collection and, therefore, it must be carefully integrated into its surroundings. Which products are needed to meet the defined goals? Which products may be developed to ensure that the installation is sufficiently creative and educational? Bearing in mind that this is just one of ten installations, it is essential to ensure coherence between them. Research: obtain up-to-date data from credible sources. If data is confusing or contradictory, all the other messages will be questioned by the reader. Redaction: use language accessible to all audiences and consider the font and typeface to facilitate reading. The message must not be prejudiced, so only present facts based on arguments that may be verified by the visitor. Final text: the facts must be presented coherently and convey reality by placing local issues in their global context, thereby ensuring visitor engagement with the subject. A human dimension should always be present. The messages will be highlighted both in the installation and in all the support materials, such as the leaflet, in order to increase the impact of the installation. To ensure that the text covers all the key aspects, it is advisable to provide the designers with a group of topics or the complete text. In this way, the designer will be able to identify the key aspects to cover in the graphics. Leaflet: whenever we approach Education for Global Citizenship topics we should ask ourselves the following questions: what are we talking about? Why are we talking about this? What are we advocating and what solutions do we want to highlight? Given that designers sometimes have the tendency to oversimplify information, it is necessary to check that the information is correct and adequate. In this case, the information focuses on the number of people without access to safe water and sanitation, and the average daily consumption of water per person in Europe. The text focused on the positive impact that water access has on individuals, communities and nations, and it mentions some recommendations adopted at a global level in order to guarantee water access for all. The leaflet should provide a visual connection to the subject. Signpost: The signpost aims to draw attention to the installation and the topic in general. An image with a short caption should be selected. The project team planned to build the installation in front of the Lion Fountain, which they had identified as the ideal place for establishing a direct link between the existing object and the new topic. A table covered with vinyl was placed in the middle of the structure. The table displays the sheet music for the well-known children’s song (“twinkle twinkle little star”) and the musical notes on which the xylophone is based. On top of the table, several water bottles were “tuned” to particular musical notes. In addition, a partition to hold leaflets was built. The vinyl displays data and facts on global water consumption. 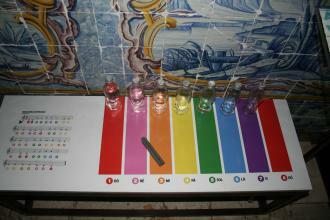 The visitors confronted with this tool were keen to play the xylophone and to study all the elements forming part of the installation, including the leaflet. This installation was placed outside the Museum exhibition rooms and was, unfortunately, damaged several times. The Museum gardens do not have permanent security to monitor the area 24 hours a day. Given the successive repairs and the danger posed to visitors by broken glass water bottles, the Museum team looked at relocating the tool and decided to create a new structure since the previous one was damaged beyond repair. At the beginning of August 2015, the installation was removed from the Lion's Fountain and, one month later, was placed inside the Museum, in an access corridor between the cloister and the gardens. 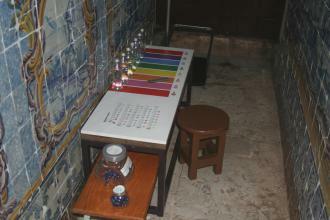 All the tile panels that adorn the cloister at the Loures Municipal Museum display water-related scenes. They are a set of bucolic images, with evident Flemish and Dutch references, that transport visitors to country landscapes populated by characters busy going about their daily lives and where the presence of water is a common theme (as a means of sustenance, communication or leisure). Furthermore, the project team added a wooden stool next to the vinyl and the glass water bottles. During the month of May, we used the Facebook page “Connected for a Better World” and shared training and information content related to the topic. The installation was promoted through the websites and social networks of partners, as well as by Flashmail: a graphic email with minimal content that invites people to visit the installation and to deepen their knowledge of the project. The team also contacted Europe Direct Information Centres in Portugal, several other museums, civil society organisations, and so on. Where justified and subject to the size of the museum, you may wish to organize an official inauguration, which can be approached from different angles, such as the use of debates, film screenings or family activities. The innovative and attractive nature of the installation. It is almost impossible to pass by this installation without interacting with it. It arouses a lot of curiosity. The strong link to the place where it is located. The structure is too fragile, as is the base that it is mounted upon. The xylophone is fixed to a fragile structure that was built specifically for the location. No labels stuck on the bottles to provide further information on the subject. It is important to budget accurately for the activities involved. As mentioned previously, the water bottles did not have labels, which could have been used to display more information. However, this is a minor problem that the project team can easily overcome by gluing labels to the bottles. It is also necessary to consider the installation’s location carefully. Furthermore, if we want the installation to cause the greatest possible impact, we must consider the need to maintain it given that museums do have funds available for carrying out repairs or reconstruction work. Visitors found the connection between water and music very interesting, as well as the xylophone idea. On the negative side, they pointed out how fragile the structure is.